U.S. "planning to take action" if Syria crosses chemical weapons "red line"
PRAGUE, Czech Republic Secretary of State Hillary Clinton reiterated a strong warning Monday to the Syrian government not to use its chemical weapons, but she would not comment on reports that there were indications of recent activity at sites believed to house those weapons, nor would she give any hints as to what action the U.S. might take if that "red line" was crossed. Clinton discussed the nearly two-year crisis in Syria during a brief visit to the Czech capital of Prague, and specifically the threat of the isolated nation's chemical weapons. The Syrian government has denied even possessing chemical or biological weapons, but is believed to have significant stockpiles. The possibility that the Assad regime could use the weapons, or lose control of them, has been a cause of serious concern for the U.S. and other nations since Syria's Arab Spring uprising descended into civil war. In Washington, a U.S. official told CBS News national security correspondent David Martin that there are indications Bashar Assad's regime has issued orders to combine the necessary ingredients to make chemical weapons material that are usually stored separately. "There is concern Syria is making chemical weapons material ready for use," a senior U.S. official separately told Martin. Speaking to reporters in Prague, Clinton reiterated that the use of chemical weapons was a "red line" for the United States, but she declined to say how the U.S. would react in the event of "credible evidence" that the Assad regime intended to use, or had used them. "We are certainly planning to take action if that eventuality were to occur," she told reporters. Clinton made the comments in response to a question about whether there was any new evidence that the regime intended to use its stash of chemical weapons internally or cross-border. She did not directly address those reports. Also Monday, the United Nations ordered its non-essential international staff to leave Syria because of an increase in security threats around the capital city of Damascus. As many as 25 of its 100 workers could be pulled from the country this week, according to a U.N. statement. Clinton drew a distinction between what she called the Assad regime's "reprehensible" behavior and violence in the conflict thus far, and the potential use of chemical weapons against the Syrian people or other nations. "There is a line between the horrors that they've inflicted on their own people and what would be an internationally condemned step of utilizing their weapons," she said. 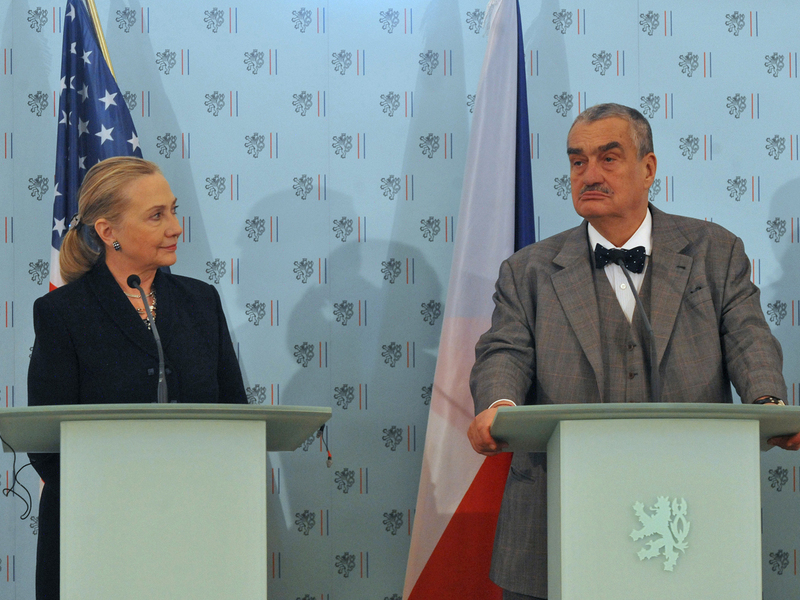 The threat of chemical weapons and efforts to interdict them was one of the topics of conversation during an hour long meeting Monday between Clinton and Czech Foreign Minister Karel Schwarzenberg, who hosted a European conference on the issue last month. Another source familiar with the matter said the Czech Republic has a battalion that specializes in the "mitigation" of biological and chemical hazards. The U.S. has worked with the Czechs in Libya to try and control the chemical weapons which were held by toppled dictator Muammar Qaddafi, and has already begun contingency planning for Syria. Meanwhile, a senior State Department official told CBS News the U.S. will agree to supply Turkey with Patriot surface-to-air missile systems to shoot down any incoming fire from Syria, if NATO partners signal their support to provide the batteries during a meeting this week in Brussels. The missiles will likely be deployed within "a matter of weeks, at least," following the conclusion of a site survey that is currently under way inside Turkish territory, according to the U.S. official. Turkey's government formally asked its fellow NATO members to bolster the country's southern air defenses in November, after shells fired from the Syrian side of their shared border killed civilians in Turkey in late October. Turkey scrambled fighter jets on Monday in response to fresh air raids by Syrian jets over the border town of Ras al-Ayn. Turkish officials said the warplanes bombed a building that had been taken over by rebel forces, wounding at least 11 people and sending many more running across the border into Turkey. Having already indicated its backing, NATO is expected to formally approve the Patriot deployment during a two-day ministerial meeting that begins on Tuesday in Brussels. Clinton will attend the summit as part of a five-day Europe trip which began Monday with her arrival in Prague. The U.S. is expected to be the key provider for the Patriot systems, but Germany and the Netherlands may also contribute to the deployment, officials tell CBS News. The Patriots, which can intercept incoming missile fire, are likely to be approved by NATO for exclusively defensive purposes within Turkish airspace. A Senior State department official familiar with the negotiations dismissed the notion that the Patriots could be used to protect any portion of Syrian airspace. The official denied the missile deployment was intended to carve out a de facto safe haven along the Syrian-Turkish border -- including some Syrian territory -- to protect the area which has become choked with refugees from Syria's civil war. Officials say a NATO-enforced "no-fly zone" is not on the agenda at the talks in Brussels this week. A Senior State Department official tells CBS News the U.S. is, "always prepared to look at ways to help in Syria," but reaffirmed that the Patriot missiles represent the primary support being considered for Turkey at this time. The official says there are "other ways" NATO is considering helping to protect its ally, but would not elaborate. Humanitarian groups have pushed for a patch of protected airspace in Northern Syria, a no-fly zone, to help alleviate the strain on Turkish refugee camps which have become overcrowded. Turkey has borne the brunt of the flood of refugees. The U.S. estimates that 130,000 Syrians are now living at Turkish refugee camps and another 70,000 displaced Syrians are living in local communities inside Turkey. Even if NATO approves the Patriot deployment to Turkey, the contributing nations need approval from their domestic governments before the hardware can be supplied. Getting that approval could delay deployment.